We are a network of 90+ community-serving organizations who are committed to bringing together change-makers to positively impact the health & vitality of communities south of Pittsburgh. 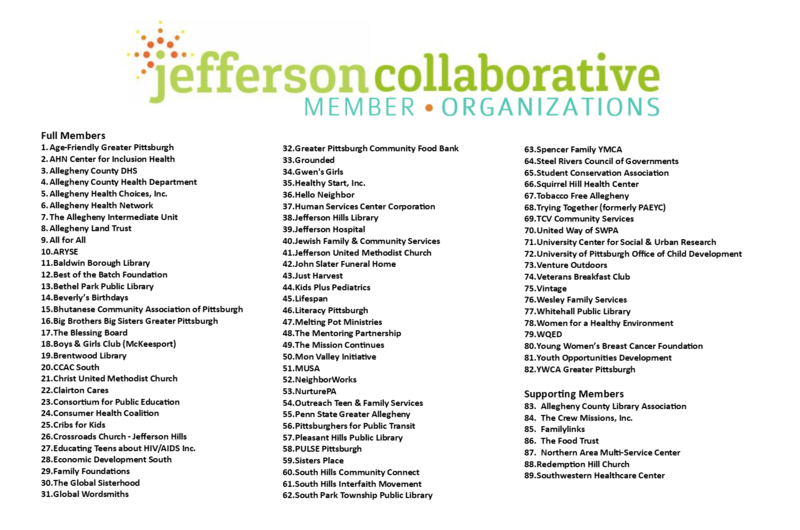 Interested in becoming a Jefferson Community Collaborative Member? Please download this Membership Form to apply, or contact Colleen Cadman at colleen.cadman@jeffersonrf.org with any questions. 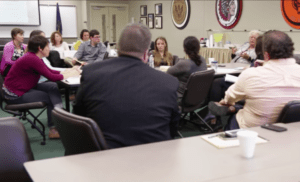 MEMBER MEETINGS are convened throughout the year (August, October, January, March, and June) and focus on advancing priority issues, capacity building opportunities, resource and data sharing, and networking opportunities. June 2019 – Details to be Announced! A lunch series focused on resource sharing and system navigation, targeted towards frontline workers. Meetings focus on specific topics and bring in speakers from a variety of sectors throughout the year. Topics for the 2019 Calendar Year include Self Care, Financial Wellness Resources for Families, and Career Connections for the Unemployed. This group coordinates wellness initiatives throughout the Jefferson Region and is currently focused on the issue of tobacco-cessation. Mental Health First Aid (MHFA) is a free public education program in which participants attend an eight-hour course with certified trainers to increase their knowledge around common mental health challenges, become equipped to offer assistance, and reduce stigma. Thirteen certified trainers from the Jefferson area have educated more than 600 community members on MHFA. If you are interested in joining our core group of local trainers, hosting a training at your organization, or attending a training session, please contact Barb Saunders at Allegheny Health Choices Inc.
Our monthly e-newsletters include meeting information and updates, Collaborative Member Spotlights, advocacy resources, and community announcements and news. Check out our past newsletters here. Email Colleen Cadman to be adding to our mailing list. A resource guide that includes contact information for qualified service providers in the Jefferson Region, organized by service area and designed to assist service providers with referrals and networking. A yearly gathering of leaders from around the region focusing on networking and capacity building. The 2018 Jefferson Forum was held on Wednesday, May 9, 2018. Click here for highlights and pictures. Local data compiled by the University of Pittsburgh’s Center for Social and Urban Research, organized by community and available for use by all members of the Collaborative.